In the last few years the Menominee Staghorn has grown to become one of the more coveted antique fans amongst collectors. It's hard to argue why, they are simply beautiful fans and very compact at only 8". Despite its small size, there is more than enough cast brass and cast iron on this fan to satisfy anyone's interest in heavy antique Americana. The Menominee Staghorn fan gets its namesake from the unique cast-brass cage struts which are mounted to the top and bottom of the motor. Brought to the market in around 1910, these fans were not mass-marketed but are still reasonable well represented amongst collections regardless. The Menominee Staghorn was designed to run on 100v AC or DC current through its incorporation of a universal brush-type motor. As a result though, they are not the quietest fans out there and I rarely run mine except to show it off. Both the brushes and the gearbox make some noise. I believe both of these noises could be quieted down with the proper servicing, but unfortunately I have too many projects in my queue and this fan is just stunning to appreciate as-is. Henry Tideman of Menominee, Michigan, founded the Menominee Electric Company in 1892. The company produced their first desk fan in 1893. This fan was a 7 ½” nickel-plated fan with a light socket on top of the motor to regulate the speed by means of resistance. This was called the No. 1 fan outfit. The No. 2 fan outfit was a 1/8 hp deluxe model with oxidized copper finish, designed to operate on 110 volts, and had a three-speed switch. State Senator Joseph Fleshiem was the President of the company, which employed 85 people by the end of 1899. I have a Menominee newspaper clipping dated February 27, 1900 that gives specific details about the suicide death of company president Joseph Flesheim the day before (Feb. 26). The article speaks of personal financial disaster and his consideration of filing bankruptcy some few days before. Telephone switchboards and other telephone components such as bells and telegraph equipment was the company’s main product. Menominee did not start producing many desk fans until about 1908. The earliest of the Menominee fans (since the turn of the century) had no motor tag, but the voltage and cycle information was stamped onto the flat brass struts that held the cage in place. 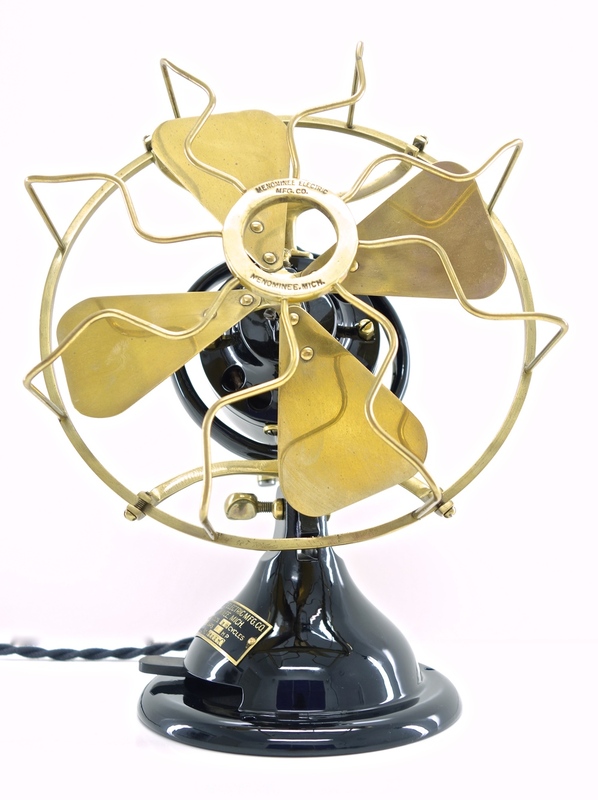 A few years later Menominee offered a line of fans that did have a motor tag with appropriate data, and a vertical switch lever that protruded through the base of the fan with a ball knob atop the switch lever. These fans had a tab cast iron base and a small compact motor. Blade sizes are 8”, (9”?). About 1910 the design was modified a bit to incorporate a horizontal switch lever adjustment for speed control. The newer style speed control lever is now made of a fiber paper-like material. Most of the other attributes continued to be very similar. Blade and cage material is brass. The earliest of the tab base fans (c.1908) had a cast brass front center ring on the guard with no markings. Later examples had a cast brass ring that was stamped Menominee Electric, Menominee, Michigan. Even later examples (c.1912) had a banner across the front center ring of the cage with the company name “Menominee”. Not sure exactly what year the first gear driven oscillating model was introduced but the earliest examples have a brass “keeper” in somewhat of a “Z” shape over the top of the wheel on top of the gearbox. I believe these models were introduced about 1910 or 1911. A few years later the keeper piece goes away and some other minor changes are also made. Based on Darryl's description above, it would appear our fan is a 1910 or 1911 model because it features the Z-shaped keeper over the oscillation engagement knob but does not have a banner in the center of the cage ring. The Staghorn in White Glove Fans' collection was originally restored by the talented AFCA member Todd Mann. It was chosen to leave the blades un-lacquered so that they could age naturally and form a beautiful patina with time. This fan has certainly done just that. Please enjoy the photos below. Clicking on any of the images will open them up in a lightbox.